This second edition of the highly successful dictionary offers more than 300 new or revised terms. A distinguished panel of electrochemists provides up-to-date, broad and authoritative coverage of 3000 terms most used in electrochemistry and energy research as well as related fields, including relevant areas of physics and engineering. Each entry supplies a clear and precise explanation of the term and provides references to the most useful reviews, books and original papers to enable readers to pursue a deeper understanding if so desired. Almost 600 figures and illustrations elaborate the textual definitions. 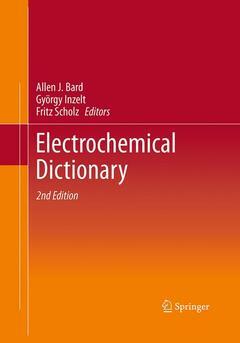 The "Electrochemical Dictionary" also contains biographical entries of people who have substantially contributed to electrochemistry. From A (absolute potential) to Z (zwitter ions).